FACT CHECK: Are ‘Seven Of The Nine’ Wealthiest Counties Around DC? During the interview, Bannon argued that Washington D.C. “is a business model. It’s a successful business model.” He touted the “seven of the nine” statistic as evidence of the financial success in and around D.C.
Five out of the nine wealthiest counties are near D.C. when measuring by median income levels. Other measurements can be used when determining wealth such as per capita income. Surrounding D.C. counties make up four of the top nine wealthiest counties when analyzing by per capita income – based on data from the U.S. Census Bureau. 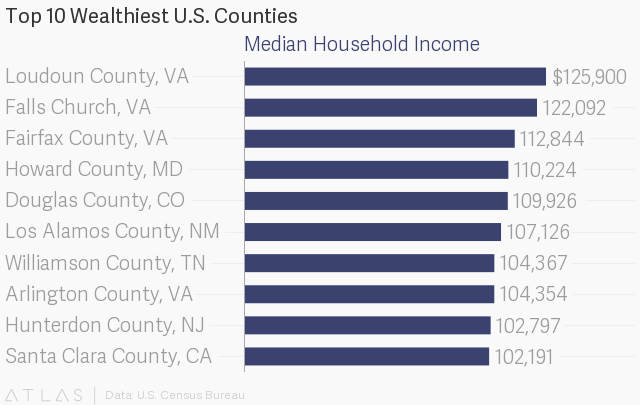 When using median family income, counties near D.C. make up six out of the top nine wealthiest counties in the U.S. and five out of the top nine when analyzing by household income. Bannon is correct that a large amount of the top nine wealthiest U.S. counties are found near D.C., but his claim that seven out of the top nine are found near D.C. is incorrect.